Buoyed by his recent successes, Mr Hawass has called for an international conference next March for countries who are seeking the return of ancient objects. Greece, Italy, China and Mexico will be among about 12 nations he expects to attend. This sounds a lot like the first real step towards the creation of an antiquities cartel, a strategy that Richard Leventhal has suggested would enable countries of origin to pool their bargaining power to extract more from wealthy collecting nations. 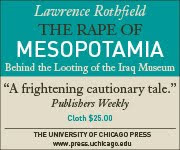 The only question is whether the bargaining will remain, as it has, on the plane of restitution and loan agreements, which in themselves do nothing to address the problem of contemporary looting and other threats to heritage, or whether countries of origin will take the opportunity to press collecting institutions to materially assist in anti-looting initiatives. Museums could, for example, be told that no country will agree to loans unless the museums first persuade their donors to contribute voluntarily (or their governments to contribute via dedicated taxes on sales of antiquities) to an international fund. One already exists, established by UNESCO several years ago, but it has failed to attract any donations. The key is to move beyond restitution to the real issue, which is what can be done to protect archaeological sites. "The most important aspect of the work is that we'll be able to go to the Afghan archaeological institute and say these are the sites in this area, if you've got guys down there you can either go and visit them or you can at least start thinking about trying to protect them," Thomas said. One hopes that the coalition forces are also going to be contacted, so that if any are operating in these areas they can at least avoid damage to sites where possible. And it would seem reasonable to try to build on the work already done by developing ways to use Google Earth to monitor a large number sites over time; it seems hard to believe that some sort of automated program could be devised to register whether holes are appearing. It would make little sense for the Afghan antiquities board -- or whoever is in charge of site policing -- to devote scarce resources to the dangerous work of protecting sites if they are not under threat while others are.